Flint Barn01263 715779work01603 870304fax Self-cateringThis lovely modern barn conversion is located in the popular coastal village of East Runton on the north Norfolk Coast. With great sandy beaches, local restaurants and pubs and just a short drive or bus ride on the Coasthopper line to the Victorian resort of Cromer along the coast, this is a great location for a relaxing holiday. Built from traditional Norfolk brick and flint materials, the spacious accommodation offers comfortable living accommodation on the ground floor and three bedrooms and a bathroom on the first floor. There is plenty to do in the area for the whole family aside from the beach, the National Trust's Felbrigg Estate is close by, the North Norfolk railway runs both steam and diesel trains through some of the regions most beautiful coastal scenery and takes you to the charming Georgian town of Holt, which is a great day out in itself. • Luxuries: TV, DVD player, CD/radio player, WiFi. Flint Barn offers weekly bookings starting on Friday. 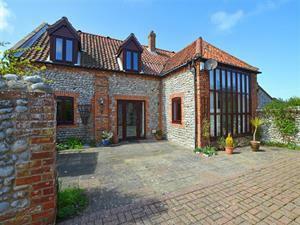 This lovely modern barn conversion is located in the popular coastal village of East Runton on the north Norfolk Coast. With great sandy beaches, local restaurants and pubs and just a short drive or bus ride on the Coasthopper line to the Victorian resort of Cromer along the coast, this is a great location for a relaxing holiday. Built from traditional Norfolk brick and flint materials, the spacious accommodation offers comfortable living accommodation on the ground floor and three bedrooms and a bathroom on the first floor. There is plenty to do in the area for the whole family aside from the beach, the National Trust's Felbrigg Estate is close by, the North Norfolk railway runs both steam and diesel trains through some of the regions most beautiful coastal scenery and takes you to the charming Georgian town of Holt, which is a great day out in itself.